Is this not what we want: To be able to walk, even trot, stand for awhile, not think, "I wish I hadn't worn these shoes"? I desire spring shoes that don't summon the dreaded phrase, "comfort shoe", but that I'll wear all day. Time to consider choices while the selection is good. A boot will still serve, but not the clunky winter kind. 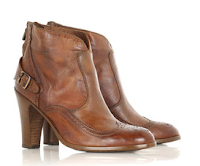 Belstaff "Agnes" boots, with substantial heel and cushioned sole. $595 from Net-a-porter. Which I will pronounce not-afford-er. One day, "l'hiver, c'est bien fini". These can only be spring shoes! Anyi Lu "Tulip" mid heel is $365 from Arthur Beren and other shoe retailers. 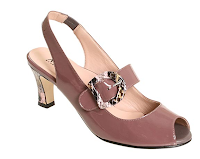 Shown in lilac, (see the snakeskin heel and trim on buckle); also comes in a vibrant royal patent and black patent. 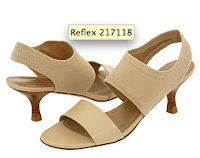 The Stuart W eitzman "Reflex" sandal is going to make that first wearing of blouse, no sweater required, feel even more blissful. Enough coverage to stay on my foot, bare enough to enjoy the pedicure. Also in black, $275 from Zappos. Arche "Perina" nubuck sandals in amarante. Worth $350 because you can wash these (they wear wonderfully) and my feet purr. And look at this delectable colour. captivating on the right woman. Also from Cole Haan (the Maria Sharapova Collection) comes an intelligent ballet flat. I loved the rich blue metallic, the built-up sole and the Nike Air cushioning and support. Price, $138; also in both silver and gold metallics. Joie's "Louie Lo uie" borrows from boys' brogues but slips on. Slightly transgressive when worn with a dress, and immeasurably more style than sneakers when paired with pants. At Neiman Marcus, $198. Shown in elephant grey (isn't this a marvelous shade? ); also available in cognac. International shipping (call Customer Service outside N. America). Nothing against sneakers. Go sneak. I do know Jack: I want my sneakers unadorned. Converse Jack Purcells, from J. Crew. Tom's are like espadrilles: easy, unpretentious and cool in a not-trying way. And may I add, blissfully unpointy, with arch and heel support. With every pair you buy, Tom's gives a pair to a child in need. Shown, the $54 Novia Classic. Tons of patterns and styles on their web site, even shoes for little feet and vegans. I've been eyeing Toms for a while now. Tried to get my son to buy some. Maybe I was just projecting. OK, I'll take the following: boots, red wedge, loafer (but in a darker color because I have big feet) and the ballerina. You are so right about tottering in uncomfortable shoes. It makes one look old, ridiculous and we might break something. I was so very pleased to see you chez moi. I have a particularly affection for Canadians having lived on the American side of your border from birth to age 16. I want the Cole Haan ballerinas...in every colour please!! and those J Crew sneakers would look great with my new striped Gap pants....yawn, more shopping for me...what's a girl gotta do? Ahhh, spring shoes. I've been eying those laceless brogues, may have to do a try-on. I like the Stuart Weitzmans too, I have a similar design from a few years ago and they are quite walkable. time to book a pedi . . .
Those brogues made my heart speed up! The color especially. LPC: Toms have huge array of patterns! Think of them as the smart woman's anti-croc. Tish: Love your blog, would have been there earlier but limit my online time. Reshuffled my reading so will see you there! hostess: Yes, perfect with your new Gap pants, which I admire! Pseu: I'll only show walkable shoes- regard the other kind as gorgeous oppressors. materfamilias: Not only are you weay ahead re spring, you can also wear cute shoes earlier! Still stuck in my Blunnies for many weeks. sisty: That colour is so refined and special! Oh, these are lovely. Thank you! Eye candy for a gray Montana day, when street slush and gravel are still the norm in our streets. While I rarely wear anything with a heel, I love the elephant gray slip-ons and the ballet flats. Excellent choices. Those are some wonderful suggestions and if you don't mind I will add one more to the list. Go to www.joychen.com and take a look. I have 2 pairs of her beautiful shoes. They are remarkably comfortable b/c the soles are rubber but they're stil veryl stylish. The companion company is glorychen if you are more interested in something less classic and more avant garde. There are only 2 stores, one in San Francisco and the other in NY and they don't have online shopping yet but you can find something you like and call one of the stores to order. Customer service in SF when I was there was excellent. LIsa: I'll second your admiration for Joy Chen, who is carried here in Toronto by Ron White Shoes. I want the ballerinas too. Interestingly, ballerina flats confer instant chic on whatever else you may be wearing. mardel: As if I needed more encouragement, and thanks! Frugal: Rare to find ballerinas with any support! Cole Haan is dedicated to relieving our foot problems without us looking like our grandmothers. Wonderful post. I am always looking for new brands of comfortable shoes. I want those boots more than I want to breathe. Gorgeous! Great post! Arche is about the only shoe with any kind of a heel that I've been able to wear over the years. Love them. But I do have to say they put out a lot of ugly shoes in between the cute ones. I just bought two pairs of Anyi Lu's at 50% off. I cannot believe how comfortable a heel can be! It's revolutionary. metscan: In Canada there are shoes-on and shoes-off houses. Generally the more 'upscale' the house, the more likely you are to be allowed to wear your shoes, but there are suprises each way. In my house I wear shoes or slipppers, my guests wear shoes. If weather is inclement they arrive in boots, carrying their shoes. That's a very Canadian thing, we carry shoes, half the year! Duchesse: A small addition to my comment. If we are having a party, shoes are kept on women and men.It would look a bit funny to see a man/women all dressed up-without shoes ;) But, I must admit, that I have seen this happen too! Those Arche wedges are gorgeous! And although practical, the price puts them still out of my reach. Sigh. g.: For good buys on Arche, check eBay. I want a pair of those Nike Air ballerina's, I wish they were sold here - I shall have to search them out and see who ships them here. I have the J Crew ones and made the laces out of thinly rolled newspaper- Cute.